You&apos;re putting some things into storage, but how do you know what type of storage you need--climate controlled, temperature controlled or just regular run-of-the-mill storage options? This guide will tell you more about what each of those means and how it will affect your belongings during a move or storage project. Temperature controlled storage refers to storage buildings/rooms that are kept at a normal temperature throughout the year. Most items do fine in temperature controlled storage. However, if you&apos;re storing sensitive items like art, wine, vinyl records, books, wooden furniture or instruments for extended periods of time, you&apos;ll want to make sure to choose a climate controlled storage facility that maintains a constant temperature and humidity level. This prevents excessive humidity in the air from damaging the finish on fine woods and papers. What&apos;s the Ideal Temperature and Humidity Level for My Stuff? Art: Paintings and fine art should be stored between 65 and 75°F, with about 50 percent relative humidity, to prevent paintings and canvases from shrinking and expanding, and to keep mold and mildew away. 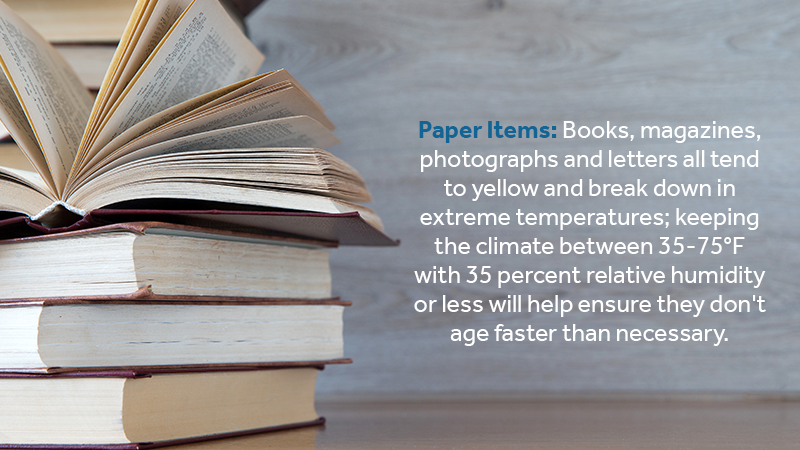 Paper Items: Books, magazines, photographs and letters all tend to yellow and break down in extreme temperatures; keeping the climate between 35-75°F with 35 percent relative humidity or less will help ensure they don&apos;t age faster than necessary. Electronics: If you&apos;re storing computers, cameras and speakers, keep them at a temperature between 50-80°F and at 30-60 percent relative humidity to prevent corrosion and mold growth. Throwing a few silica desiccant packages in the packaging will also help. Wooden Furniture or Instruments: Antique furniture and delicate instruments don&apos;t react well to temperature or humidity fluctuations; keep them between 55-85°F and at a relative humidity of 30-50 percent. Cleaning and polishing furniture before storage will help keep it in tip-top shape. If you have questions about storing other sensitive items, contact their manufacturer if possible or give us a call for more information. In general, a temperature around 65°F and a relative humidity of about 30 percent should be adequate for most storage needs. 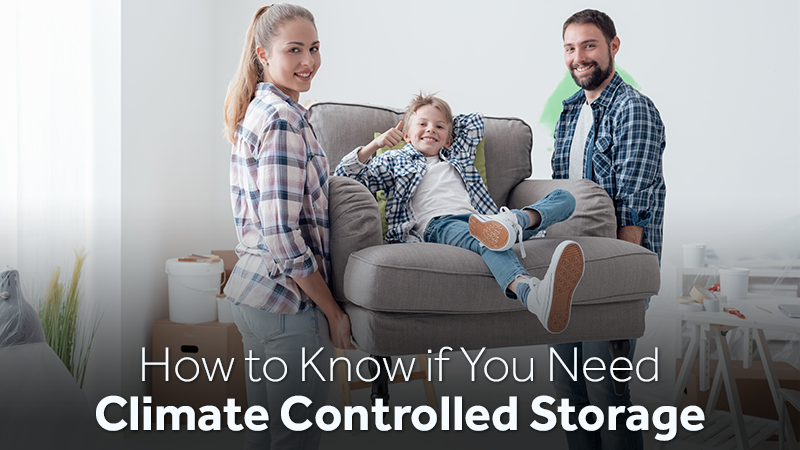 Do you really need to pay for climate control if you&apos;re just storing things for a week or two, or preparing for a move? The answer can be tricky. In general, for most everyday households, you can get away without climate controlled or temperature controlled storage for a few weeks, assuming there aren&apos;t drastic temperature fluctuations and that your items will be well-protected and carefully packed. Silica desiccant packs in boxes of electronics, books and other sensitive items will help keep humidity levels low, and packing more sensitive items higher in your storage space will also help. Still have questions? Contact us today at Zippy Shell Houston, and we&apos;ll help you choose the perfect storage option to keep your belongings safe and protected.